Youthfront offers a unique three day experience specifically designed for students in grades 9-12. We’ve taken our years of experience providing impactful summer camp plus feedback from our high school youth and parents to build a special program just for students in this season of life. High school youth are faced with a lot of influences trying to grab their attention and shape their identity – it gets pretty confusing! We have created an opportunity to be away from the noise that will allow campers to explore what it means to find purpose, live in the midst of today’s culture, and make a difference. 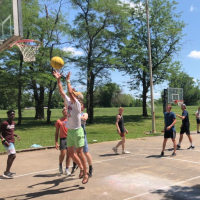 We promise a lot of FUN, a lot of hanging out with friends, and all of our best camp attractions in the beautiful wooded setting of Youthfront Camp LaCygne. We have developed a program that is relevant to the issues high school students encounter in the complexity of their lives. We wrestle with what it means to be a teenager today amidst the challenges of bullying, identity, depression, cyber-everything and more. You will walk away from your three days with a better understanding of God’s love for you, despite what you are facing. You will feel relief as you learn other kids face the same challenges and questions as you, and you will walk away with deeper friendships rooted in faith and unconditional love. We seek to provide safe spaces throughout the day to ask essential questions and seek answers alongside a community of caring friends and camp staff. We teach the way of Jesus driven by compassion and love. We also promise time to reflect and a way to learn more about who you are, and how you can make a difference in the world. We are committed to providing a safe environment where you can experience God’s presence. We believe you will walk away feeling loved and a better understanding of your faith. Our schedule is created to provide space for conversations of faith and fun with friends and caring adults. We have witnessed again and again that these conversations allow for a greater faith in God and more compassion for yourself and the world around you. We structure our days around the practice of prayer, so we start each day together in our Chapel with Morning Prayer. This prayer includes reading of scriptures, music, silence, and both corporate and private prayer. These are sessions for campers to choose from to encounter some of their most pressing questions. Some of our sessions include: What is the Bible? What is love? What is my spiritual growth path? This is an essential time for high school campers to ponder and wrestle with the concepts and ideas they encountered in their breakout session. This is a guided time to help them apply what they are learning. We block out the rest of the morning to spend time together as a cabin sharing what they learned in their breakout sessions and what they wrestled with in their personal time of solitude. This allows the campers to attempt to put words to the things they are learning and encountering as a teenager in today’s society. Our entire camp pauses and gathers together in our Chapel for Midday Prayer. This prayer times includes reading of scriptures, music, silence, and both corporate and private prayer. Each day we open up all of our camp activities and facilities for campers to hang out with one another and our staff. In addition to our main attractions (pool, splash park, waterslide, ropes course and more), there are organized activities offered throughout the afternoon. We offer freedom for campers to learn how to make choices on their own and build authentic relationships with one another and God in the context of camp community. Campers gather together in our Chapel each evening for worship and to hear more from our Storyteller about our theme. We make sure to carve out some time after our Evening Gathering to hear from one another about what we are learning and how we are being encouraged and challenged in our own life and faith. This is a time to play and have fun with a different activity each night! Play is an important part of expressing our faith and knowing God’s joy. Evening prayer as a cabin to close the day and head toward restful sleep. Sign me up! I can’t wait! Still unsure? Call us at 913-262-3900. We are happy to help answer any questions you may have.